Blazon of the badge: A unicorn couchant Argent, horned, unguled, maned and tufted Or, gorged of a coronet of four fleur-de-lys ( two visible ) and four crosses pattée ( one and two halves visible ) Or. SOURCE, NOTES & CREDITS: Text for blazon from page 83, "The Double Tressure", No. 20, 1998, in an article "Badges of the Scottish Officers of Arms" by Mrs. C. G. W. Roads, then Carrick Pursuivant of Arms. 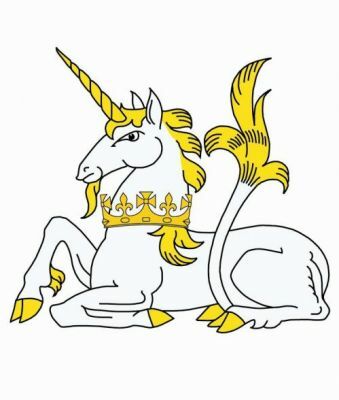 We have here the Badge of Unicorn Pursuivant of Arms in Ordinary, who is Liam Devlin, appointed on 6 January 2016. The most recent previous holder of this office was Reginald John Malden, sometime Unicorn Pursuivant.